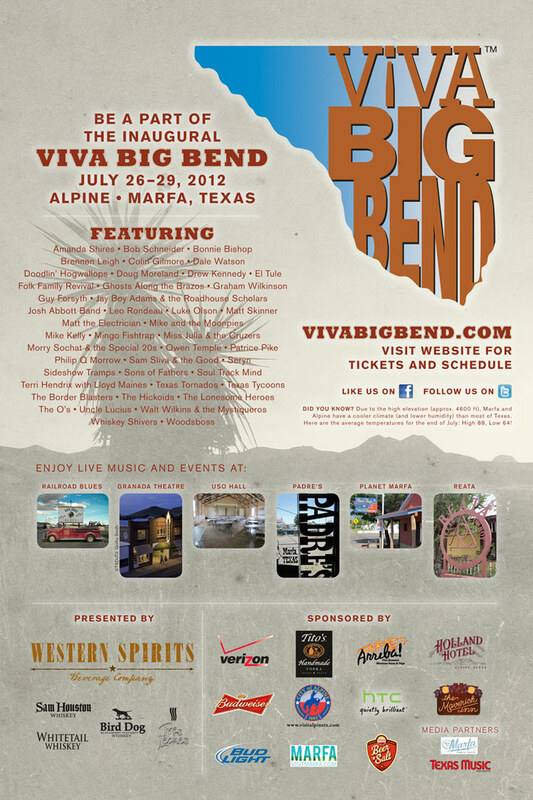 You're invited to the first-ever Viva Big Bend, a music festival and industry conference to be held July 26-29 in Alpine and Marfa, Texas. Produced by Texas Music magazine, the event will feature more than 50 performances (lineup below), functions for music industry professionals, an exhibit showcasing artwork created by musicians, family friendly activities and more. Four-day passes are currently $55. Additional information is available at www.vivabigbend.com. I hope to see you in far West Texas later this month! Keep an eye out for more information leading up to the festival, and be sure to get your tickets soon!